← Wild food! – A journey of discovery! When Julius Caesar landed on the shores of Britannia in 55Bc He didn’t just bring masses of roman legions with him, he also brought commodities and foods that the ancient inhabitants of that small island had never imagined before. Many of the staples of the roman diet have their origins in other earlier cultures, Such as the Greek and Etruscan civilisations, however, they had a well established culinary repertoire that would change the face of food and drink in Britain for ever. Think about the Vegetables that your local supermarket supplies, the chances are the romans introduced most of what you’ll find. Vegetables introduced to Britain included garlic, onions, shallots, leeks, cabbages, peas, celery, turnips, radishes, and asparagus. The leeks’ importance as a part of the staple diet of the British population is illustrated by its later adoption as the national emblem of Wales. 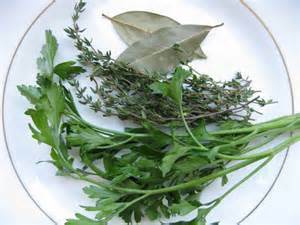 Amongst the many herbs they introduced to Britain were rosemary, thyme, bay, basil, coriander and savoury mint. They also introduced herbs that were used in brewing and for medicinal purposes such as Rue. 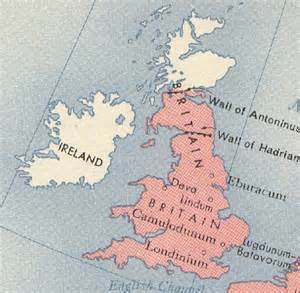 After the initial establishment of the roman empire in Britain it took until approximately 43 ad to assume complete control of the lower reaches, ( the Celts) to the north were never subjugated and subsequently Emperor Hadrian built his wall between 122 ad – 128 ad to keep the blood lusting barbarians out of sight and mind. 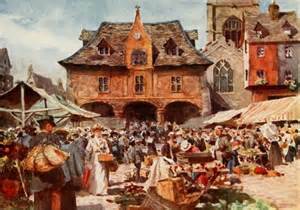 The roman marketplace ( Agora) from which the term agoraphobia is born was a vibrant cornucopia of animals, tradesmen, stall holders, hawkers and all other classes of society. The sophisticated system of government and societal standards allowed opportunity to one and all. The elite would rub shoulders with the serfs and not bat an eyelid, maybe they kept a respectful distance from the urchins that frequented the agora but in general their chagrin was well hidden. At the agora myriad items could be purchased, such as kitchen utensils, jewellery, cooking pots, clothing, furniture, animals, building tools, even slaves would be paraded to potential wealthy investors so they could peruse the goods in order to ascertain for which purpose said slave would be best assigned. A typical scene of life at the Agora. 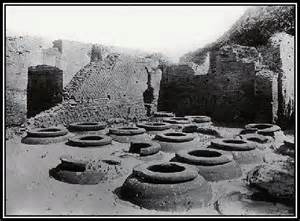 The preservation of food stuffs at the agora was always a problem, has the ancient method of salting was only really a viable option for meats; Vegetables were left to the mercy of the heat ( 3 hot days a year in Britain) and the flies. Nevertheless the enormous variety of produce on offer was put to use in some excellent and diverse dishes that we shall now turn our attention to! 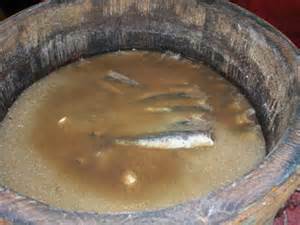 Liquamen or garum is a liquid very similar to anchovy sauce that is still produced in Italy today. 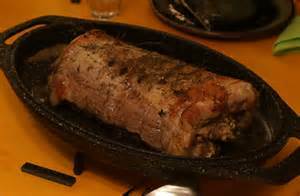 Its production was an essential aspect of roman cuisine. The procedure employed was the same one used by the Greeks, whom, has previously mentioned influenced roman life immeasurably. The technique of creating such a complex sauce was both time-consuming and elaborate but deemed necessary to add flavour to many dishes. The Basic technique of garum Production revolved around maceration of fish, salt and herbs ( including Basil, thyme, oregano, savoury, bay leaf ) etc. Freshly caught fish, usually whole small mackerel or the intestines of larger fish would be placed into vats with the salt and herbs and sealed. The vats would be left in the sun until fermentation began, and left to ferment for up to 3 months. The lack of sun in this new climate hindered this process, but, time and patience would render acceptable results via improvised methods. Much of the original garum used in Britain was imported from the roman heartland on the continent until acceptable techniques overcame this need. Large Vat of fermenting garum. 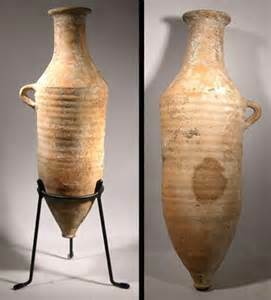 A classic roman vessel for the storage of garum. From the vats the liquid would be firstly strained through cloth leaving behind a sludge but allowing a clear oily liquid to pass. It is this liquid that would be the resulting garum; It as been compared to MSG! 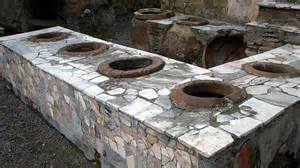 Analysis of garum remains found at the manufacturing site in Pompeii revealed free amino acids, the dominant one being mono-sodium glutamate (MSG), a result comparable to modern Italian and Asian fish sauces. Apicius was a collection of recipes written between the mid 4th and early 5th century in Rome. Little is known about the exact recipes used by Romano – Britons between 55Bc – 410ad but indications are that Apicius. was referenced often by the multitude of slaves who had been trained has chefs, and of course general household cooks who had access to the recipes via handed down knowledge. 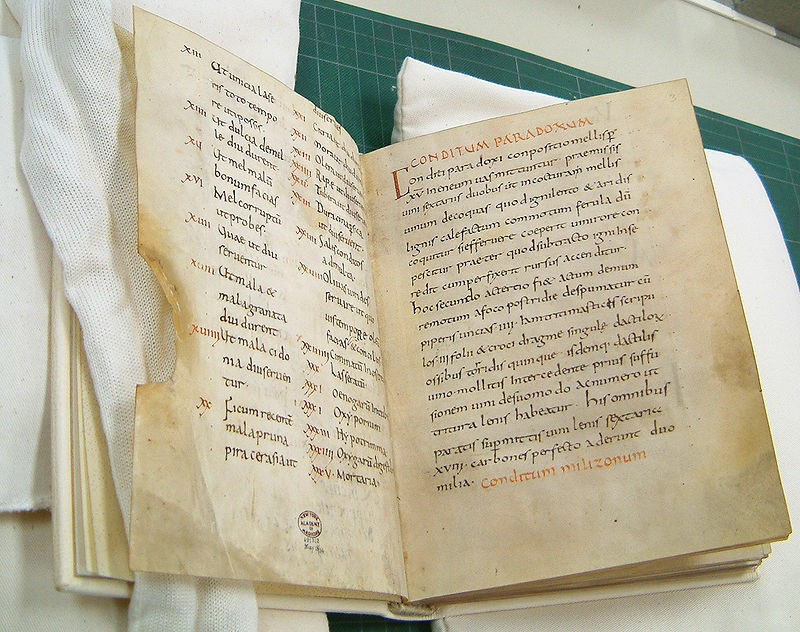 The Apicius manuscript to the left (ca. 900 AD) of the Monastery of Fulda in Germany, was acquired in 1929 by the New York Academy of medicine. Romano-British recipes would be adapted from Apicius originals with locally sources meats and introduced vegetables. Pork in the form of wild boar was hugely abundant from local pastures and forests and stews utilising it were a very important Romano – British staple! APER ITA CONDITUR. Wild Boar. Clean the meat with a cloth. Sprinkle it with salt and ground cumin and let it rest (overnight). The next day, roast it in the oven. When cooked, serve in a sauce of ground pepper, gravy from the boar, honey, stock, boiled wine and raisin wine. (Apicius, Book 8, I-I). Rub the pork with the cumin and salt and roast, covered, at 180 degrees for 1 ½ – 2 hours. ( I cut the fat off half way through and make crackling, separately.) Remove the roast from pan and keep warm, covered with tinfoil. Add the meat juices, stock, honey and wines to the roasting pan and deglaze, season to taste plenty of white pepper is my preference. Slice the roast thinly and pour the sauce over it, warm in the oven before serving. Authentic accompaniments would be boiled or baked Vegetables such as turnip, cabbage or leeks. A modern version of a classic roman wild boar roast. A sample of the herb Rue; Please note; Rue is now known to be poisonous when consumed in substantial amounts, it should be avoided at all cost by pregnant women. Parboil and drain the parsnips. Add the olive oil to a sauce pan and gently fry the cumin to release the flavours. Add the Rue ( Thyme ) Chicken stock, Fresh Coriander and Chives and bring to a gentle simmer. Place the Parsnips back in the saucepan and gently warm through for about 10 minutes until the Parsnips are al dente. As with all modern dishes its advisable to season with salt and pepper. White pepper was the most widely used in Romano – Britain but black pepper is acceptable. “The staff of life” was by no means new to Britain, having been made in varying qualities for centuries before the romans even considered a new home in northern Europe. 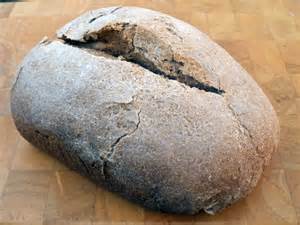 Lots of the pre-Roman bread in Britain was a basic un-leavened rustic type of flat bread. Many types of grain such as spelt, buck wheat and even dried flower seeds have been utilised in the bread making process. Whether or not ancient Britons had discovered yeast is unclear however we do know that Romano – British bread did to some degree use yeast. 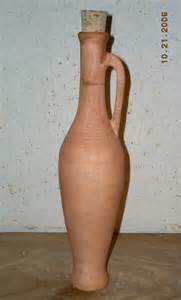 The Yeast of Roman Britain was not the simple light brown living paste of today, it was more a hit and miss concoction, sometimes as basic as a wine and flour paste or a liberal skimming of beer froth. 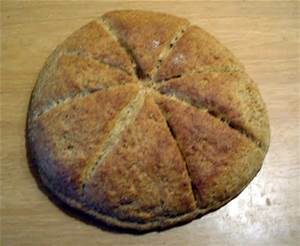 There are countless shapes and styles of Romano – British bread of which a selection appears below. They almost all followed simple recipes such as – flour, water, yeast and honey! On occasion olives would be added to create a more satisfying product. batch of dough prior to rising. The torn piece would be wrapped in damp cloth and used to start the next batch of dough, this cycle would continue indefinitely. It is said that some Italian family bakers today have chef starters that are 100 years old. The wine consumed in (enormous quantities) by the people of Roman Britain is quite possibly the least altered of all transcendent commodities , even the methods of production have changed little in over 2000 years. Both red and white wine were produced in Britain using the same techniques. buried in the ground in covered barns to offer the optimal temperature for fermentation to take place. To the right is an example of Dolium from an excavated sight in Italy. This would have been a familiar sight to wealthy land owners in Britain during the roman occupation. White wine was made using the same procedure however the must (wine ) was allowed to rest on its lees (sediment) which developed flavour. Chalk or marble dust was also added to white wine to cut the acidity or bite. Note; Lead was often added to wine as a sweetener and is said to have contributed to the madness of the Emperor Caligula. It is said that roasted door mouse was a popular dish in Romano – Britain but recipes seem thin on the ground. Certainly Ostrich was eaten and many other foods that would be considered unusual to the modern British diet. Snails, frogs, otters etc have all featured on various banquet tables for the inebriated rich man. In the scene I have included the link for below, Keith is challenged to reproduce a Roman style dish containing garum, and whatever Keith could reliably research when not in the pub smoking park drive and drinking wine. I hope this brief article has highlighted the direct influences still felt today in much of british cuisine and indeed life in general, things that may not have arisen if Julius Caesar had not embarked on his journey to Britannia…..! This entry was posted in Uncategorized and tagged Food, ingredients, Romans, traditions. Bookmark the permalink. 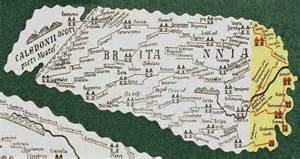 13 Responses to Romano – Britain! A culinary view! I cant thank you enough for this wondeful article Jay. I myself have never looked into the Roman culinary history and found this both fascinating and an eye opener. A wonderful new blogger and friend, please check out his new site. Yet another well written and well researched article. Greatly appreciate the combined history and related recipes. Graphics well chosen as well! Thanks Jan. The research for the knowledge gaps is self educating, so in writing these blogs I’am learning new things all the time. The images I think embellish the blogs very well. I have finally read your blog. Great detail and information. Thanks Anke, not just for reading the peice but also your interesting comments. 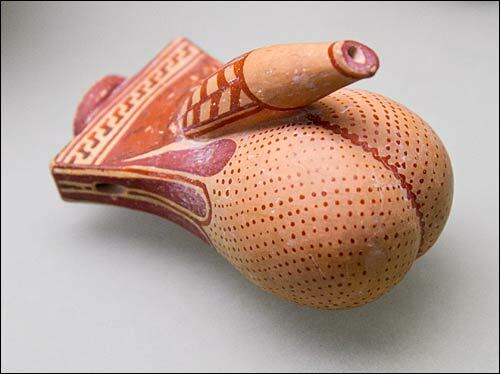 Regarding *that* Amphora….Clearly The British sense of humour was a Roman gift! I did promise to include one item of joviality in every blog! Note; if you do pub quizzes always remember the last Roman emperor in Britain was Romulus Augustus. Great article Jay. Don’t much fancy the dormouse, need a dozen to make a butty ! I read somewhere the Romans invented the beef burger . Might do the wild boar next week, sounds good. Well done Buddy, more of the same please. The pork stew featured at the end in the video is something I’ve tried, a little refinement and it was excellent. Thanks pal…It took a bit of research and some old not used in a while knowledge. My only regret was that I forgot to include the Hamburger/ Beef burger snippet you give me!! Excellent article Jay. Tim Chastain, your Christian friend on Twitter.